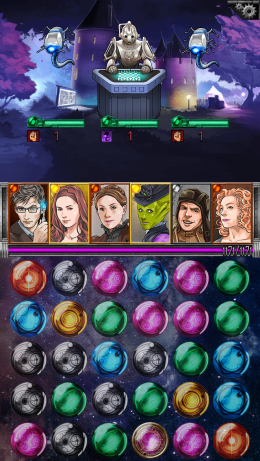 Out of all the possibilities in time and space, Doctor Who: Legacy (Free) is a gem-matching game. It’s the sort of gem-matching game where you don’t simply swap gems, you drag them around for a good five seconds leaving as many little matches in your wake as you can. It’s the sort of matching game where you build up a party of characters and match gems to make them fight Daleks and Weeping Angels. In fact, it’s the sort of gem-matching game where all the characters, enemies, and set dressing are very distinctly Doctor Who. But beneath that BBC-tinted skin is a game remarkably similar to, say, Puzzle & Dragons (Free). Similar, though not identical. Most of its differences lie in the structure beyond the actual gem matching. Its free-to-play model, for example, is generous. It piles on the content with no energy-based timers or stiff charges for a shot at a lousy new character. If you pay, you pay for time crystals. These save you time when ranking up your characters and let you roll for the ones you can’t quite get to drop on your own. Similarly, its team management is streamlined. Each character levels up as you play with it in your team of six. Each level gives you a point to put into one of its three stats—attack, health or healing. 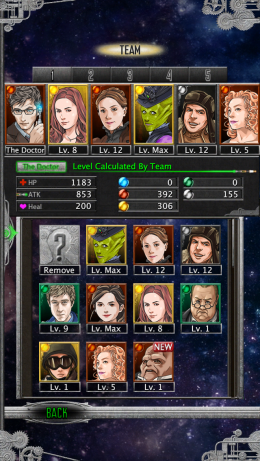 You don’t have to feed, say, your Rory Williams to your Amy Pond to rank her up, or collect dozens of Straxes to evolve him into a mega-Strax. Once you have a character, progressing it is a gentle process. There is an element of randomness to the process, which also means an element of grinding. Every tenth level a character needs to be ranked up to keep progressing. That costs time fragments, which come in a few different types and can be found randomly in specific levels. So yes, you might need to grind to rank up a character, but at least the game is kind about this—almost to a fault. It lists everything that can be unlocked in a level, be it characters, costumes or particular sorts of time fragments. With that information easily at hand, you’ll know exactly which levels to replay ad nauseam. And that’s Doctor Who: Legacy at its mechanical base. You build a team and set it against modern Who villains by matching gems. You pick characters based on color or special ability if you’re wise, or based on favorites if you’re sentimental. Sentiment plays a big part in the appeal of Doctor Who: Legacy, after all. It is rife with references to the show. There are tons of characters to unlock, new and old, all pulled directly from the series. Some have alternate costumes based on iconic looks, and their profiles include things like their first appearances. Levels are dressed up to look like scenes from certain episodes, and the music—well, themes from the show are well accounted for. The references can be a bit hollow, though. The game portrays multiple seasons of the show—six and seven, so far—but doesn’t have much in the way of story or plot. It’s also missing pretty much all the clever dialogue that makes Doctor Who so fun to watch. Doctor Who: Legacy is clearly made with love for the source material, but it does little to kindle that love on its own. That’s not to say it’s a bad game. If you’re intrigued by the mechanics you could do significantly worse—similar titles might give you more to do, but they’re also rife with manipulative free-to-play tactics, most of which are blessedly absent here. It’s also certain to evoke a happy sense of familiarity for anyone who is a fan of the show—particularly Matt Smith’s recent run as the Doctor. There’s even a special fan area that’s unlocked when you spend a few bucks, and it’s full of fan-favorite locations that don’t fit in the current season-based level sets. Doctor Who: Legacy might not be a love letter to the series, but it’s clearly in love with it. If you share that loyalty, there’s plenty of fun to be had with the game. Its gem matching is of a clever sort (if not at all original) and you’ll be busy for hours unlocking your favorite characters. Who hasn’t wanted to run through the universe with River Song, the Doctor and Winston Churchill, killing Daleks and Cybermen all the way home?